Earth Day is one of our favorite times of the year. At the Co-op, we feel a tremendous amount of gratitude for the bounty that our earth has given us. Please join us in our efforts to support a greener planet and embark on our journey to living zero waste lives at home. This upcoming week, we have many opportunities for us to learn and make a healthy impact in our community. Everything in Bulk is 10% off for co-op owners only. Both bulk foods and bulk wellness products included. “Your Zero Waste Home” will help you produce less waste not just at home. You’ll learn tips and tricks to help reduce the amount of garbage you produce anywhere you go, while living a healthier, more satisfying life. Adapting a zero waste lifestyle is rewarding and economical if you do it right. Come learn how. Following the class will be a short tour of the Co-op! 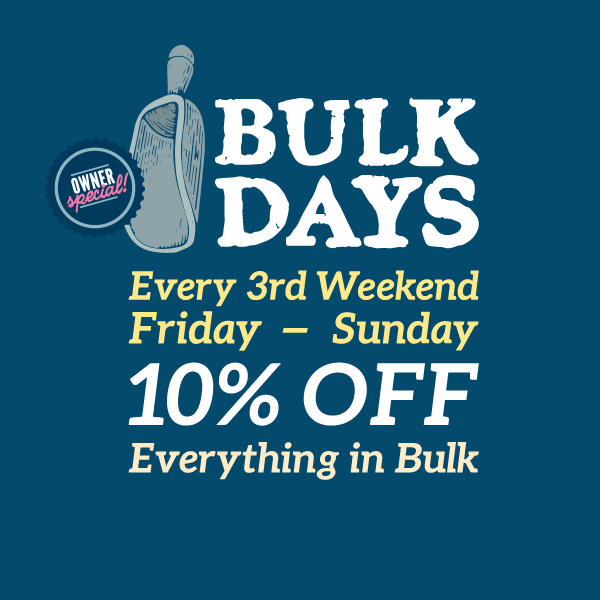 Everything bulk is 10% off for EVERYONE! Bring your own containers to fill and receive an additional 10% off your entire purchase!! Join us at the Snohomish County Campus Plaza in Downtown Everett to celebrate our beautiful planet! There will be educational activities, food trucks, and prizes!